This silkscreen print emerged after I had made several prints based on pine beetle galleries. I started with a colour photograph of a blaze cut into tree bark on the trail to Mount Murray, just outside Wells. Photo of blaze scar on tree, Mount Murray trail near Wells. After changing it to greyscale, I “posterized” the image with five tonal thresholds. Black & white version of blaze photo. Posterized version of blaze photo. The next step was to generate film positives and make photostencils. Film positive for background gradient (1st stencil). Espresso grounds in drip bowl. Back to the pine beetle bark. This section intrigued me; something seemed familiar. Following my same work flow, I changed the photo to black and white, posterized it, then created the film positives to make photostencils. This entry was posted in art, Nature, screen printing, Uncategorized on December 30, 2018 by Bill Horne. 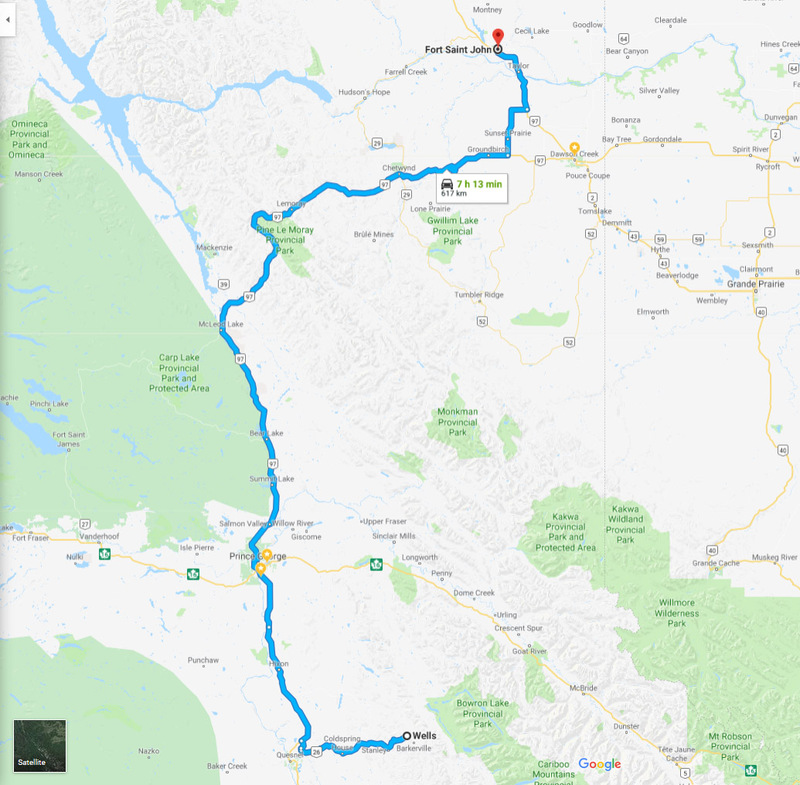 After much anticipation and preparation (see “Peace River Screen Printing Project” post below), Claire and I packed up the car and drove to Fort St John on May 11 – about an eight hour trip. This is a fine time of year to drive north, not just because there’s so much daylight at our latitudes, but also because the remaining patches of snow in the northern Rockies delineate the contours of the mountains that tower over the Pine Pass in their undulating folds. We don’t drive as fast as Google. Verena Hofmann welcomed us to the Treaty 8 Tribal Association building in FSJ upon our arrival and helped us unpack. The T8TA building has wonderful spaces for meetings and we set up in the back where we could access water, as well as the back parking lot for sunlight photostencil exposures. We were honoured to be able to hold the workshop there and very appreciative of T8TA’s support, as well as Verena’s organizing assistance. In addition, we were given permission to stay at the Tse’K’wa house above the cave at Charlie Lake. It was an enormous privilege to stay in this very special, significant place. To see the cave is a powerful experience and we’re grateful to have had that opportunity. Claire above Tse’K’wa – Charlie Lake cave. Tse’K’wa – Charlie Lake cave. Claire peers through an opening in the outer rocks. Lichen on rocks at Tse’K’wa – Charlie Lake cave. We had a small, but enthusiastic and extremely productive group in the workshop, with various friends dropping in over the course of the weekend. On the Saturday, we explored hand-cut and torn wax paper stencils, simple registration systems, printing gradients, and then coated screens with photoemulsion so they could dry in a dark closet overnight. Matt printing his first gradient. Donna’s first prints from a hand-cut wax paper stencil. Matt’s first prints from a hand-cut wax paper stencil. On Sunday morning, the weather was still perfect for exposing these in sunlight outside the back door. The first exposures took about 12 minutes, but we shortened that gradually to 8 minutes as the day progressed. At one point we were able to test three kinds of film positives: a retouched photocopy on acetate, hand-cut rubylith film & hand-painted Fotostrip masking fluid. The weekend went by very quickly and the participants gave some really helpful feedback and ideas for ways to improve on it if we have the chance to do another. Thanks again to Verena and T8TA for hosting and helping to organize the weekend, to Matt, Donna and Claire for their participation, and to Nathalie and Reg for dropping in! Sunlight exposure with 3 kinds of film positives. 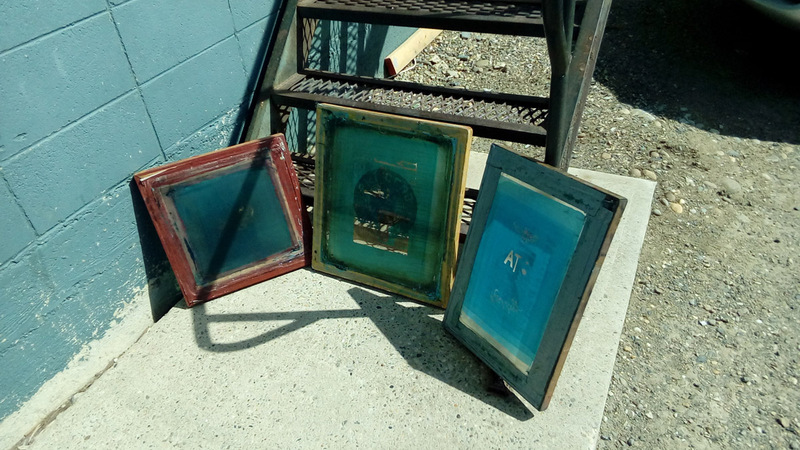 Screens post-exposure hardening in the sun. Once we finished packing up, we drove 15 minutes south to Arlene and Ken Boon’s farm at Bear Flat on the Peace River where they generously treated us to a lovely supper, breakfast, overnight cabin stay, and tour of their land and buildings. We hadn’t realized they had worked in the log building business, so having a chance to see some of their handiwork – especially their creative renovations and reconstructions – was inspiring. Their museum houses many precious items, including a photograph of a horse-drawn plane for planing logs into timbers. We didn’t take any photos inside; you have to go there to see it! Bill with Ken and Arlene. Solar panels above workshop at the Boon’s farm. Arlene and Ken were planting corn when we left – a crop not possible to grow in many places north of Quesnel! From Bear Flat we drove back through FSJ and east of Pouce Coupe to Demmit, just inside Alberta to visit Teresa and Peter von Tiesenhausen. Just as we arrived, they plugged in a brand new 10 KW array of solar panels on a new timber frame structure. Very exciting to watch their electrical meter start to go backwards! Teresa shows Claire the structure under the solar panels. Peter takes a video of the meter running backward. Teresa kindly took us on a tour of the Demmit Community Hall. She and Peter were instrumental in the planning, fundraising and construction of this beautiful timber frame & straw bale building. An inspiring, successful project on every level. From Demmit we made our way back to Gundy for an overnight visit with Verna Savor and Rick Broswick who moved there several years ago from Wells. It was a pleasure to catch up with them as well as enjoy their usual big-hearted hospitality. After a short pit stop in Dawson Creek, a visit to the art gallery and a short chat with the Curator, Kit Fast, we were back on the road in time to return to Wells at sundown. In our last hour on Highway 26, we saw five black bears and one porcupine – a beautiful ending to a wonderful trip. Special thanks to our many friends and Chuffed donors without whose support we could not have held the workshop or made the trip! This entry was posted in art, Nature, screen printing, Treaty 8 Territory, Uncategorized on May 19, 2018 by Bill Horne. Burnt trees and roots near Soda Creek, BC. Burned out tree roots near Soda Creek, BC. I encountered many stark, poignant and haunting views. Some charred, vaporized tree roots looked like dinosaur footprints left as they fled a shield volcano millions of years ago. If I was Harold Rhenisch, I might write a poem! Sign for ʔElegesi (Alexandria in Tŝilhqot’in) by the road above the Rudy Johnson Bridge across the Fraser River. Burnt hills near Soda Creek, BC. The Rudy Johnson Bridge across the Fraser River near Soda Creek, BC. View from the Rudy Johnson Bridge across the Fraser River. When I reached Mackin Creek Farm on the west side of the Fraser, north of the bridge, Cathie Allen was hard at work gathering the last of their cabbages, broccoli and cauliflowers before a heavy frost was to arrive that night. After many years of enjoying the wonderful vegetables she and Rob Borsato produce, I was glad to finally visit this beautiful place. And buy some food for the winter! Cathie Allen works another row before frost sets in at Mackin Creek Farm. Pig at Mackin Creek Farm. The red circle indicates Mackin Creek Farm, northwest of Williams Lake, on the west side of the Fraser River. Mackin Creek Farm circled in red; a little closer. Mackin Creek Farm circled in red; situated on a beautiful bench above the Fraser River. Here are some of the burnt needles that fell on our metal roofing in the summer. I wonder if some came from the Soda Creek area? For some very powerful images from the summer’s fires, see some of the recent newsletters by photographer Chris Harris and the Facebook photo albums of Jesaja Class. This entry was posted in Uncategorized on November 1, 2017 by Bill Horne. I welcome support from any of our friends for this new and exciting project to offer an introductory low tech water based screen printing workshop in Treaty 8 Territory. This entry was posted in Uncategorized on October 23, 2017 by Bill Horne. After bringing the field of yellow mini-stakes back from the Far Afield exhibition at Omineca Arts Centre (see the previous two posts), and after having it on display with “Reservoir” at Amazing Space Gallery here in Wells through the summer, it was time to dismantle it. The dried, unfired terracotta clay can be reused one day. I can cover the canvas board framed in reclaimed fir with fresh clay if the opportunity arises again to replant the stakes and add more to the many voices resisting the Site C dam on the Peace River. It can have another life. Pulling up the stakes revealed a lovely pattern left by the donors and other contributors when they pressed their stakes into the wet clay, as well as the cracks formed by the clay as it dried. Dried terracotta field beneath “Stakes in the Peace”. Removing the chunks of dried clay from the supporting canvas board revealed yet another pattern, this time similar to a watershed. Under the dried field; terracotta on canvas. Scraping and rinsing the remaining clay exposed a subterranean drainage pattern. Under the dried field; terracotta on canvas with fir frame; 48″ x 16″. Under the dried field (detail). To keep up to date on efforts to stop the Site C dam, see this Facebook page (one of several), Sierra Club’s site, or follow Desmog‘s investigative reporting on this and other issues. And the stakeinthepeace campaign. To learn about the BC Utilities Commission hearings on Site C, to attend a hearing or to make a submission, see their site here. This entry was posted in Uncategorized on September 18, 2017 by Bill Horne. “Reservoir” as seen from above. Cast resin, silkscreened mylar; painted canvas courtesy of Claire Kujundzic. Base approximately 22” x 18”. Photo courtesy of Denis Gutiérrez-Ogrinc. Like the “Stakes in the Peace” terracotta field with screen printed stakes in the group exhibition Disturbances in the Field (at the Omineca Arts Centre), “Reservoir” deals with the Site C. Since BC Hydro’s proposed dam lies within Treaty 8 territory – a treaty signed in 1899 – I visualized the reservoir submerging the treaty. So I screen printed a two page layout of the text of Treaty 8 on mylar, then cast it in resin in a clay mold shaped like BC Hydro’s renderings, with a small corner of the treaty remaining above the surface of the reservoir to represent my hope that we can still stop this project. Side view of “Reservoir” with Dane-zaa screen printed on the side of the acrylic stand (“Our children will use the Peace River in the future”). Side view of “Reservoir” showing Cree syllabics for “mamahtâwisîpiy” (magical, supernatural or sacred river of wonderment). On the sides of the acrylic stand are Cree and Dane-zaa words for the Peace River, in tribute to the strength of these cultures and the power of their languages. And as a reminder that we are all treaty people, as our friends in the valley have patiently explained. Claire gave me a piece of painted canvas to place under the resin to catch light and colour – another element of hope to balance the daunting challenge we face. Clay mold with foam core dam face and cutaway; ready to pour resin. Clay mold closeup with land forms approximating the valley as it is today. After the first pour with page two of Treaty 8 fully submerged. This entry was posted in Uncategorized on May 20, 2017 by Bill Horne. Forest of stakes outside the Boons’ farm; photo courtesy of Darcy Shawchek. The Stakes in the Peace campaign began when I heard that BC Hydro was drilling on Ken and Arlene Boon’s property in preparation for the Site C dam on the Peace River. Most of this work was way ahead of schedule and unnecessary; a form of bullying leaders of the resistance to Site C. I thought, if they Boons are getting drilled, we can pound a stake outside our house, too. So Claire and I pounded a yellow stake into the ground, then posted a photo. Claire & I pounding in our first stake in solidarity with the Boons last summer outside our place in Wells, BC. Wendy Holm and others took this idea and transformed it into a brilliant solidarity campaign in which people (singly or in groups) could pay $100 to have their name on a yellow stake outside the Boons. 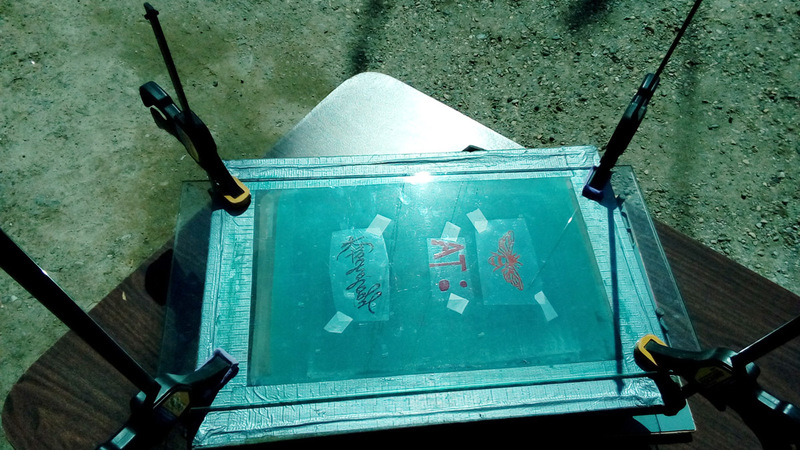 It took off, and now there are over 600 stakes forming a forest of solidarity which has raised over $60,000 towards legal costs for resistance to Site C.
Silkscreen platen jig for printing four stakes at once, each with two URLs – to be cut in half after printing. One of the jigs for printing the second side; these are in Dane-zaa and Cree with English translations. Freshly printed stakes drying on the rack before printing the second side. Cutting stakes at the kitchen table, one by one. 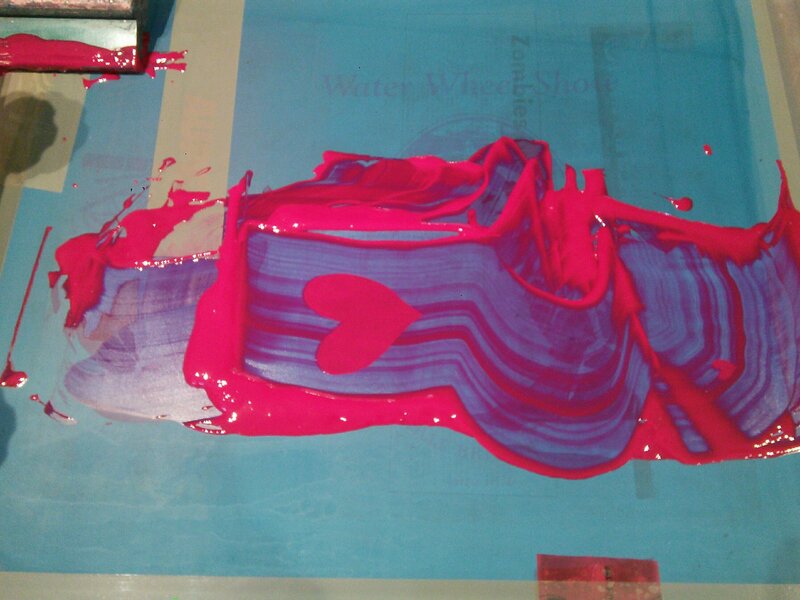 Screen printing stakes with water based ink. Testing out stakes’ ability to stand when inserted in terracotta clay – works fine! All the stakes had stakeinthepeace.com on one side, with Cree, Dane-zaa or various hashtags on the other side. At the opening on Friday, May 12, I began inserting the stakes (short video here). People attending had the opportunity to put their own stake in the Peace for a minimum donation of $5 (all funds will go to the stakeinthepeace.com campaign). For anyone outside Prince George who’d like to participate, they can contribute via the PayPal button below. Slab of terracotta to simulate the field at the Boons – ready for staking out! Photo courtesy of Caitlin Chaisson. “Stakes in the Peace” (silkscreened wood, terracotta, reclaimed fir; approximately 48” x 16”) after the opening night. In the course of the exhibition, we raised enough money to pay for six actual stakes at the Boons, thanks to the contributions of many generous people. Kate from Ft St John plants the first stakes. Stakes in the mid-section part way through the opening night. Khast’an Drummers singing and drumming at the opening. Claire inserts a stake for her mother Ann for Mother’s Day. View from one end, near the end of the opening night. Closeup from one end of the terracotta “field”. Caitlin & Claire check out the field of stakes. Our Curator, Caitlin Chaisson, behind the field of stakes. In my mamahtâwisîpiy shirt (Cree translation courtesy of Art Napoleon). Mini-stakes return home; terracotta has dried and cracked. Closeup of mini-stakes in dried, cracked terracotta. Thanks to: Caitlin Chaisson, Curator, for her enthusiasm and support; Denis Gutiérrez-Ogrinc for photodocumentation; John Howarth for plinth construction; Khast’an drummers for performing at the opening & Kym Gouchie for welcoming all to Lheidli T’enneh territory; Claire Kujundzic for all-round support, including technical; Denise Dauvin for hospitality; Randy Hadland for feedback; Yvonne Tupper for the hashtags; Art Napoleon for the Cree translation; Verena Hofmann and Treaty 8 for the Dane-zaa translation; the peoples of the Peace for their courage and persistence in the face of adversity. Anne Kelly, Rita Neighbor, Holly & Julie (Vancouver), RanD Hadland, Elizabeth & Aashima Mathias, Gail Noonan, Colette Chisholm in memory of Joe A Chisholm, Jennifer Iredale, Caitlin Chaisson. Thanks, everyone! This entry was posted in Uncategorized and tagged art, Disturbances in the Field, Peace River, Site C on May 10, 2017 by Bill Horne.